For this week’s faculty spotlight, we talk to David M. Gallagher, MD, chief of the Hospital Medicine program at Duke University Hospital. In this interview, Dr. Gallagher discusses the challenges and joys of working in hospital medicine, the history and future of the field, and efforts to improve his electric guitar skills. I have been at Duke since 2006. I was hired to lead the Durham Regional Hospital medicine program through a transitional period as it became more closely aligned with Duke University Health System (DUHS). 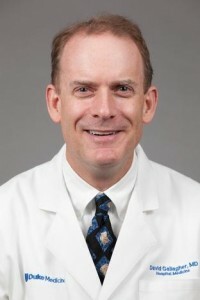 Prior to Duke I was Regional Medical Director for hospital medicine at Sutter Health in the Sacramento region. Before that I was a primary care physician doing clinical work in a variety of settings: office, hospital, ICU, and nursing homes. I think I have experienced most aspects of general medicine in my career. I became the medical director of the Duke hospital medicine program in 2010 and Chief of DUHS Hospital Medicine programs in 2012. Our programs are at the three Duke hospitals and we have approximately 100 physicians (full, part-time, and moonlighters) providing clinical care to our patients. About 40 have faculty appointments within Duke Department of Medicine Division of General Internal Medicine. What are your responsibilities as Chief of the Hospital Medicine program? As Chief of Hospital Medicine I lead a team of physician and administrative leaders that focus on our core missions of providing excellent clinical inpatient care, partnering with DUHS on hospital-based initiatives, working with various educational institutions to teach Duke learners, and partnering with GIM division to continue to grow our academic work. This year I was fortunate to be chosen to be the Associate Chief Medical Officer at Duke Hospital which is a supporting role to Dr Lisa Pickett, MD (CMO of Duke hospital). No day is the same and there are a large variety of things I get involved with. I may be working on strategies to help reduce length of stay, analyzing financial data on our program’s growth and performance, or interacting with patients and their families. I truly love my job(s) and the great people that I work with. What’s the biggest challenge of working in hospital medicine? Right now I would say our biggest challenge in hospital medicine is twofold (although there are plenty). First, with the economic and governmental landscape drastically changing in healthcare, hospital medicine physicians need to continue to partner with their respective hospitals to ensure that care that is delivered is high-quality, safe, and cost-efficient. The second major area is to continue to improve our academic visibility. Hospital medicine is still a “young” specialty, so the early years for us at Duke and DRH were spent stabilizing our clinical workforce. In the last few years our faculty has gone from virtually no academic productivity to regular presentations in our national and regional meetings, more consistent articles being accepted/published, and some individuals within our group having grant funding. We still have a long way to go in this area but we are proud of our accomplishments in this short time span. I most enjoy the dynamic environment with the rapidity of decisions and variability of the clinical situation I might find myself in. I really feel like I make a difference in the lives of the patients that we see. I miss the longitudinal relationships that I used to have with patients as a PCP but I get to know my patients pretty quickly in the intense five-day period that they are hospitalized and still get great patient interactions from this experience. How has hospital medicine changed over the course of your career? Hospital medicine has changed significantly since I first called myself a hospitalist in 2002. We have figured out how to make the career sustainable by addressing issues that were causing high burnout amongst our physicians. The schedule and workloads have been better defined to address these issues as the result of strong advocacy on the part of the Society of Hospital Medicine. The specialty has become more accepted by others and is now a highly regarded career choice by top medicine residents. What changes do you see coming over the next decade? In the next decade I see the true explosion in adding advanced practice providers (APPs) to hospital medicine programs. I would think that programs would use a combination of APP-MD tightly paired teams to handle the complex patients (leveraging that relationship to see more patients efficiently) as well as autonomously functioning APPs (working within appropriate guidelines and oversight). That’s already occurring in many programs but I really see that as taking off. There will also be different roles that RNs play as well. I think there will probably be efforts to get some PCPs back in the hospital collaborating with hospitalists on taking care of the truly complicated patient with multiple comorbidities to help improve the transition of care into and out of the hospital for those most vulnerable patients. I have twin girls who are in 6th grade and being a good Dad is my big passion. I am hoping that my electric guitar skills will improve someday, however, I have found the axiom true that it’s hard to teach this old dog new tricks.